Pseudotsuga sinensis var. brevifolia has been reported from the limestone region in northern Việt Nam, but more recent assessments of the Vietnamese trees (e.g. Hiep et al., 2004) have concluded that the common species on the ridge tops and summits of the limestone mountains is P. sinensis var. sinensis. The distribution of P. sinensis var. 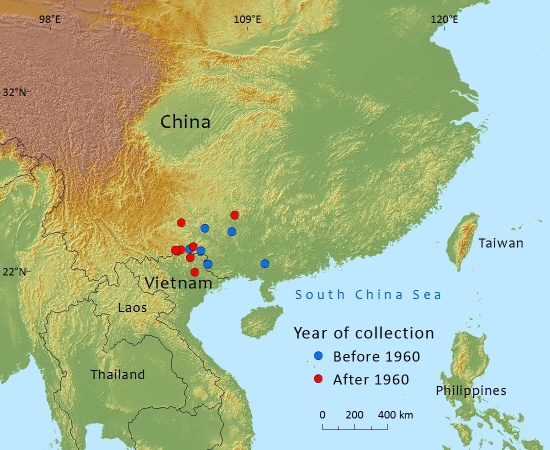 brevifolia in Atlas of the Gymnosperms of China (Ying et al., 2004) borders the distribution of P. sinensis var. sinensis in Việt Nam given on a map in Hiep et al., (2004). It seems unlikely that var. brevifolia is restricted to China, but it may also be incorrect determination of specimens on either side of the border that has lead to this parallel distribution pattern. A critical evaluation of the material (and this taxon) is needed. In the Flora of China (Wu & Raven 1999), var. brevifolia is treated as a distinct species. Occurs in China in the Provinces of Guangxi (SW), Guizhou (Anlong, Lipuo); Việt Nam (N ?). The area of occupancy is estimated to be less than 2000km². The population in China is very small just a few mature individuals in each locality, very rarely found in pure forest. The total population is estimated to number about 200,000 individuals. The number of mature individuals is estimated to be less than 10,000 with no subpopulation containing more than 1000. Scattered on south-facing slopes and mountain tops, on calcareous (limestone outcrops) and rocky soils at altitudes between 1000 to 1300 metres aove sea-level. Grows in scrubby shrubland rather than forest. This variety appears to have a restricted range and the area of occupancy is less than 2000km², the population is severely fragmented and there is continuing decline due to exploitation and loss of habitat due to the impacts of agriculture, especially grazing by livestock. The number of mature plants appears to be low, certainly less than 10,000 mature individuals and there is continuing decline and all the subpopulations appear to contain fewer than 1000 mature individuals. This variety is therefore listed as Vulnerable. With further information it might even qualify for an Endangered listing. This variety occurs in a limited area within the extensive eroded limestone massifs of SW China; its true extent and rarity remains unknown (see under Taxonomic notes). Trees are often inaccessible on mountain summits but those on easier sites have often already been logged. Grazing is also a problem in some areas. Yang, Y., Christian, T. & Rushforth, K. (2013). Pseudotsuga sinensis var. brevifolia. In: IUCN 2013. IUCN Red List of Threatened Species. Version 2013.1. <www.iucnredlist.org>. Downloaded on 12 July 2013. Ying, T.S., Chen, M.L. & Chang, H.C. (2003). Atlas of the gymnosperms of China. China Science & Technology Press, Beijing. Y.Yang,T.Christian,and K.Rushforth, 2014. Pseudotsuga sinensis var. brevifolia, from the website, Threatened Conifers of The World (http://threatenedconifers.rbge.org.uk/taxa/details/1050).